Profuse and continuous blossoms make the African violet one of the indoor gardeners top choices when selecting plant material. Although many people avoid choosing African violets because they feel the plants are too temperamental in nature, the average gardener can easily grow hearty, healthy plants if the most fundamental rules of correct watering, sufficient humidity, and proper lighting are observed. To provide the ideal growing conditions for African violets, we need to remember that their natural environment is in the shade of the forest, near waterfalls and flowing streams and rivers, in the midst of abundant humidity. To simulate these conditions of moisture in your indoor growing environment, it may be necessary to purchase a humidifier or vaporizer for your home. In addition to moisture in the air, the soil in which your plants grow should also be kept slightly moist at all times, but not so soggy that it damages the delicate root hairs that absorb nutrients and moisture for the plant. It’s best to water the plants from the bottom by filling the saucers in which the pots set and allowing the African violets to “wick-up” the water; then pouring off the excess from the saucers after an hour or so. 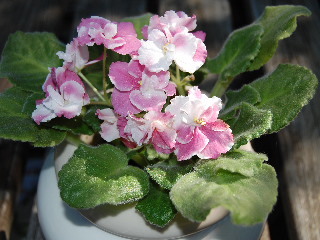 This method of watering also prevents “spotting” of the leaves, which can occur if water droplets get onto the foliage of your African violets. Along with satisfying conditions of correct moisture, paying attention to proper lighting is necessary in order for your violets to reward you with a profusion of blossoms. Opinions vary as to which window exposure is best for African violets; however, all growers agree that indirect sunlight (shade) is best, as the sensitive leaves can become burned from the direct sun. In general, it seems that light from an east or west window is best during the months of autumn and winter (September to March), and light from a northern exposure window is best during the warmer months. In the early spring, new plants can be propagated from the existing ones by cutting healthy growing leaves, leaving the leaf stem about 1 to 2 inches long. The newly-cut leaf stems should be kept in water until roots form, at which time the new plants should be potted (using specially formulated African violet potting soil) in 3” pots. 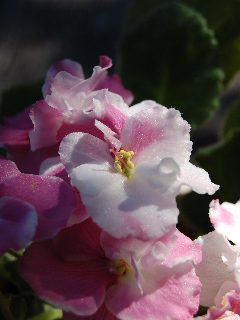 Special plant foods for African violets are also available at your local garden centers. So, it’s not really that difficult to manage these “wooly” leaved favorites and to get them to reward you with a steady supply of colorful blossoms. Just remember water, humidity, and lighting in the proper dosages, and you’ll soon join the ranks of so many other indoor gardeners in naming the African violet as your favorite houseplant!